Former Republican President, Rupiah Banda, says he is hopeful that Africa leaders will strive to provide sustainable solutions to the many challenges facing the youths in the continent. Mr Banda revealed that from his interactions with students at Boston University, its affiliate institutions and from the University of Ghana, it came to his attention that African youths are faced with common problems which were not insurmountable if the leaders committed themselves to finding workable solutions. This is contained in a press release issued by the office of the Fourth Republican President Administrative Assistant, Mikatazo Wakumelo. “From the various universities I have been to, the concerns of the African youths are about their future; whether their leadership will be able to provide them with a good health delivery system, education, jobs. Their hope is that the economies of their countries can grow to address their concerns,” President Banda said. MeanwhileMr Banda is tomorrow expected to continue with his African tour of duty as he heads to Tanzania. While in Tanzania, Mr Banda is expected to lecture on good governmence and democracy at Mwalimu Nyerere’s Mlimani campus on Thursday afternoon. His lecture will be attended by staff and graduate students from the University Development Studies and political science. The Tanzanian trip is part of the Boston University African President Centre where Mr Banda is the current President in Residence. Mr Banda was recently in Ghana where he shared his experience with staff and students from the University of Ghana, the oldest in that country. 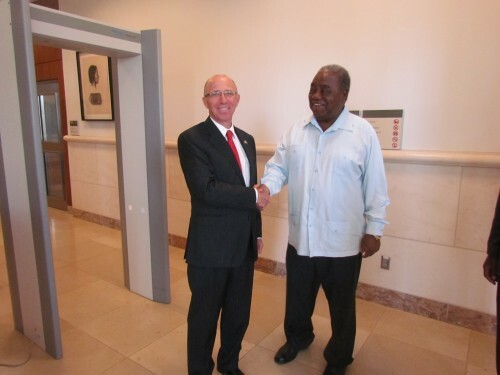 While there he also had an opportunity to meet former Ghanaian President, Jerry Rawlings.